ABUJA—PRESIDENT Goodluck Jonathan, former Head of State, Major-General Muhammadu Buhari (ret) and 12 other presidential candidates, yesterday, signed an undertaking to ensure free and fair polls as well as run issue-based campaigns for the forthcoming general elections in the country. President Jonathan is running on the platform of the Peoples Democratic Party (PDP) while Buhari is contesting on the banner of the All Progressives Congress (APC). They gave the assurance during a sensitisation workshop themed: “2015 General Elections: Sensitization workshop on Non-Violence”. 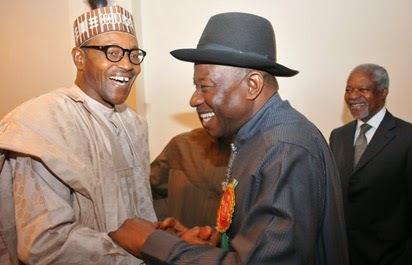 Jonathan and Buhari put aside their electoral fisticuffs and embraced excitedly upon arriving for the workshop. President Jonathan and Buhari had been engaged in bitter electoral battle in a bid to win the February 14 presidential polls. Apart from the duo, the chairmen of the two dominant parties, Alhaji Adamu Mu’ azu, PDP, and Odigie Oyegun, APC, also hugged themselves in a bid to send a signal to their supporters that violence is not part of democracy. This came as all the 14 presidential candidates of the various parties contesting the election also signed a peace agreement to ensure free, fair and credible polls. Other candidates who signed the peace agreement included Tunde Anifowose Kelani of the Action Alliance, AA; Dr. Rafiu Salau of Alliance for Democracy, AD; Ganiyu Galadima of Alliance Congress, AC; Alhaji Mani Ibrahim Ahmad of ADC; Chief Sam Eke of Citizens Popular Party, CPP; Ambrose Albert Oworu of Hope Party; Prof. Oluremi Sonaiya of KOWA party and Chief Chekwas Okorie of the United Progressives Party, UPP. The peace agreement otherwise known as “Abuja Accord” by the organizers of the event essentially barred the contestants from making inciting speeches in whatever guise that could cause the eruption of violence before, during and after the elections. *To run issue-based campaigns at national, state and local government levels; in this, we pledge to refrain from campaigns that will involve religious incitement, ethnic or tribal profiling; both ourselves and agents acting in our names. *To refrain from making, or causing to make our names or that of our party, any public statements, pronouncements, declarations or speeches that have the capacity to incite any form of violence, before, during and after the elections. *To commit ourselves and political parties to the monitoring of the adherence to this accord by a national peace committee made up of respected statesmen and women, traditional and religious leaders. Before the signing of the accord, eminent personalities including former United Nation’s Secretary-General, Kofi Annan; the chairman of the event and former Secretary-General of the Commonwealth, Chief Emeka Anyaoku; the Chairman of the Independent National Electoral Commission, INEC, Professor Attahiru Jega; former Nigeria’s representative to the United Nations, Professor Ibrahim Gambari and the Special Adviser to President Goodluck Jonathan on Inter-party Affairs, Senator Ben Obi took turns to harp on the need for violence-free election. In his speech, Annan asked the contestants to avoid the use of inflammatory languages to underscore the need for the country to prove its big brotherly position in Africa and beyond with the election. “Aside being the eighth largest exporter of oil, Nigeria has become a player in telecoms, agriculture and in banking. She is a major contributor to UN peace-keeping and is now at the UN Security Council. You can’t abstain from voting and then complain”, he said. For the candidates, he enjoined, them to “focus on party policies and not on individuals. Avoid inflammatory languages and don’t use ethnicity and religion to gain political sympathies. “Nigeria doesn’t want to repeat the experience of Kenya where violence took them back several years. 2015 will confirm Nigeria’s progress in the eyes of the world. The stakes are high but I know Nigeria can rise to the challenge. Nigeria’s success is Africa’s success. Nigeria has the future of Africa in her hands, make Africa proud”, he said. Similarly, Anyaoku remarked that the workshop was necessary due to increasing provocative words being used by the candidates and the attendant consequences which had unfortunately been the lot of previous elections in the country. He said that the forthcoming election has put Nigeria on the eyes of the international community. “Regrettably, we cannot deny that in our country we have history of violence occurring before, during and after elections. Already, explosion, burning of buses have been reported in some states, and we are also witnessing increasingly acrimonious pronouncement by candidates and spokespersons of political parties. Nigeria and its 2015 general elections are in the eyes of the international community”, he said. The Chairman of INEC, Jega, among other things identified 10 causes of violent elections in Nigeria. He said: “In answering the question of what makes our elections so prone to violence, I have identified specific as well as general causes of violent elections which have been identified by scholars. In particular, I have paid attention to the causes which are attributed in countries such as Nigeria to the tendency for contestants, political parties, politicians to see electoral contest as something that you have to engage in and that you must win at all cost. “In a country like Nigeria, where there is what scholars called low level of institutionalization, stakeholders tend to use resources at their control in the contest for political power and Samuel Huntington said, the ‘wealthy will bribe, the students will riot, the workers will strike, the mob will demonstrate and the military will coup’. “Of course, this depends on the extent which the political party, candidates and other vested interests now try to mobilize and to win power at all cost. So, it is very, very important to recognize that in a country like Nigeria, there are many factors that can lead to violence in an elections. “Attitude and the disposition of parties and candidates will determine to a large extent whether we will have peaceful and non-violent elections. So, parties and contestants, although have responsibility to ensure peaceful conduct of elections. Of course, there are other agencies, the election management body has an important responsibility. It has to do its job with competence, with professionalism and with non partisanship. Security agencies also have to do their jobs. Former Nigeria’s scribe to UN, Professor Gambari said that the success of the February election rested mainly on the technical competence of INEC, the prevailing security atmosphere and the need for the political actors to play the game by the rules. “The credibility and peacefulness of the impending election will depend on three critical elements. First, the technical competence of INEC. I think that has been demonstrated. The second concern is security. The security agencies and INEC should provide security and sense of fairness to all the stakeholders. The security agencies which are supporting the elections: the police and the military must accept that their roles are to facilitate. “The third and most importantly, the contestants themselves will have to accept the rules of the game and to educate their supporters to encourage against violence. These three elements will be what will, in my view, lead to free and fair, credible elections in Nigeria”, he said. Special Adviser to the President on Inter- Party Affairs Senator Ben Obi, said the workshop “is a product of extensive and inclusive consultations between my Office and the ruling party on the one side and all opposition parties who have collectively agreed on the need to come together to jaw–jaw and to agree on ways and means of collaborating with each other in the bid to ensure that the elections of 2015 are free and devoid of violence. President Jonathan, while addressing the audience said the programme was timely. Going into memory lane, the president recalled the effect of violence on the polity saying, it had wrought more harm than good. He said: “This programme is very apt and we need it so that at the end of the elections, we don’t need to kill people or burn our houses. I believe that we will get there if we all decided to do what is right in this country. I am quite pleased because the emphasis here is electoral violence, not electoral malpractices. “For electoral malpractices, the courts can help to some extent, but there is nothing the courts can do about electoral violence. If a property is burnt, it is burnt. If you identify the person, he can be charged for arson, but in most cases, mob action is always difficult to control not to talk about people that were killed. “If you look at the history of our elections, we were told there were significant violence in the elections of the First Republic and that violence led to the collapse of the First Republic. In the Second Republic key actors in the political parties were relating well at the beginning. After the elections, governors from different parties were relating, but as the second round of elections were coming, the behaviour changed and people started abusing and insulting themselves. I was not surprised that the Second Republic did not last when the politicians started abusing themselves, and institutions. “If you looked at the 2011 elections, we approached it better. I am quite pleased that a number of civil society groups are here. It was generally agreed that the 2011 elections was quite better than any other election in the country and for that, we thank Prof, Jega and his team. Even then, after that election, there were violence in some parts of the country. “In Kano, property were destroyed. In Bauchi State, 10 Youth Corps members that were involved in the election were slaughtered. Then we asked, what led to this level of violence? The violence came when the results were being announced and not on the day of the election. “The results from those states had been announced and towards the end, it was clear that a particular candidate was going to win, violence erupted in Kano and Bauchi and we asked, why should there be violence? The only thing one can deduct is that, you can’t say that there were malpractices to favour the candidate that won because in Kano, we got 26 per cent of the votes. In Bauchi, I got 15 per cent of the votes. “Even in states that were opposition, where we got more than 50 per cent, there were no violence. So, you see that what lead to violence sometimes is not because of electoral malpractices. There are some other causes of violence. First is the factor of the politicians. I believe that one of the key things is the provocative statements we make and when we are making these statements, we forget that the younger ones are listening. Your followers who call themselves your fans are listening to you. We threaten our opponents. “A governor came to me and said that a governor in another party told him that immediately they take over government, he will go to jail. If you are now threatening somebody that he will go to jail if you take over government, that person would want to fight as if he is defending himself from going to jail. I am not talking about the Presidential candidates, but our followers. My conviction is that for those of us who are politicians, we must avoid provocative statements, we must avoid threatening ourselves. “The other factor is that of the religious leaders who preach the hate message, instigating their followers to be confrontational and sometimes, label some candidates as the enemies of their fate. If our religious leaders do that kind of preaching, what do you expect? “We always follow what our religious leaders say and if our religious leaders keep preaching such hate message what do you expect? in that instance, your followers are not going into the election based on internationally known election principles, they will think they are going for war. “There is also the pronouncement of our traditional rulers who make provocative statements as if they want to divide the country. This has never helped because as leaders, you have your subjects and followers. When you make these provocative statements, you are indirectly instigating them to become extremely violent”, he said. He continued: “What is the way forward? How do we make sure that, as a nation, we minimize violence if we cannot completely ignore it? I agree that we must not gather the world to discuss electoral violence again. But if we must not do that, we must do certain things to stop it. We have a few weeks to elections and so, there is really nothing much we can do except to strengthen the institution and advise ourselves on how we should conduct ourselves. Also speaking, Buhari recalled his experience in the court and said that unless the judiciary shun political biases, tendencies were that elections in Nigeria would be continued to be rigged. “Some of the speeches so far are base on hope. Some of these hopes are in the files because of our nasty experiences. What happened in 2003, 2007 and 2011 when we contested the general elections and ended up in the Supreme Court; these three Supreme Court judgements are available with the government printers for all those who are really serious to know what is happening in our political development. When the military eventually surrendered to the multi-party democratic system 16 years ago, we hoped that we should have learnt from the developed countries that went through the painful processes of stabilizing their system rather than insisting on making the same mistakes. “I will give a few examples which I am sure most of you will recall. In 2003, when we disagreed with the elections, we spent 30 months in court. Out of those 30 months in court, I only missed four sittings. The first time was when we went to bury my Vice Presidential candidate, Chuba Okadigbo while I was out of the country on the other three occasions. “In 2007, we spent 18 months in court and when we eventually reached the Supreme Court, the seven Justices of the Supreme Court were divided on it. Three of them said they annulled the elections because it was not conducted according to law; three others said yes, there were flaws, but all the same, the ruling party won the election. The Chief Justice of the Federation then looked at them and cast his vote for the second group and so, we lost 4-3. “In 2011, I said that I, as Presidential candidate will not go to court, but I made sure that my party went to court and we spent about nine months again and it was the same story. There was no way the ruling party will lose judgement. That was painful especially when you considered what actually happened on the field. For example, from two states in the northern part of the country, we were lucky to get competent party agents. When results started coming in for these states, they tried to announce the result that were announced or physically brought to INEC office after going through the collation centres. “They compared the results against the INEC register in those states and entered them into the clear outer and the computer; and the popular adage that garbage in garbage out manifested itself. What came out was that the Presidential candidate of that party was programmed to lose 40 per cent of its score and in the other states, it was 26 per cent. They showed it to INEC which asked the party to officially write a complain and we wrote. We were given the assurance by INEC that they will look into our complaint. But the next thing we saw was results being announced that we have lost the election”, he said. He also faulted INEC for not complying with courts’ pronouncements, alleging that the relevant institutions have not always followed due process inspite of clear instructions. “Some of you know by name Retired Justice Salami who was heading the Presidential election panel. We made a presentation that in a number of states, the election was not conducted in accordance with the Electoral Act and the states were mentioned. We demanded that the register be brought to prove our case and the panel said there was nothing wrong with that and INEC was asked to comply. It was not produced. Justice Salami was redeployed and another Judge was brought who reversed that decision. That has become history.